RVO reported that white plumes from Garbuna were emitted during 6-10 October. Deep booming noises were occasionally heard. On 7 October an explosion produced forceful emissions of dense white vapor. Weak to moderate seismicity with an ash emission occurred during March 2008 (BGVN 33:02). According to the Rabaul Volcano Observatory (RVO), white vapor rose from Garbuna during the first 12 days of July; however on 13 July, moderate-to-strong emissions of pale-white to light-gray ash clouds were observed. The ash emissions formed a column that rose ~ 1 km above the summit area. Seismic activity was generally very low during the period. Additional ash emissions occurred on 5 August, accompanied by incandescent lava ejection, and between 23 September and 1 October. Ash plumes rose ~ 1.6 km and drifted NW. During 1-4 October, forceful emissions of dense white plumes from Garbuna were accompanied by intermittent ash emissions that rose to an altitude of 1.6 km. RVO reported that occasional weak roaring and rumbling noises were heard in Garu village, about 9 km NW. An overflight on 3 October revealed that existing vents at the summit had increased in size and new vents and fumaroles had appeared in the E sector of the lava dome. The main vent, which had been located on the cone's outside flank, had enlarged considerably (more than tripled in size) and had merged with the November 2005 vent. The original vent that opened on 17 October 2005 was larger and vigorously fuming. There was little evidence of juvenile material having been ejected and surprisingly little eruptive material around the summit; however areas more than 1 km away from the active vents were cratered, possibly from lithic bombs. Fumarolic activity in the summit region away from the currently active vents had ceased. On 6-10 October the RVO reported that white plumes from Garbuna were emitted and deep booming noises were occasionally heard. On 7 October, an explosion produced forceful emissions of dense white vapor. Seismicity increased to a high level after the explosion. It was characterized by continuous overlapping tremors that continued for a while before declining to a low level again. RVO recorded low-frequency earthquakes on 6 and 8 October. No volcano-tectonic (high-frequency) earthquakes were recorded with those events. Information Contacts: Herman Patia, Steve Saunders, and Ima Itakarai, Rabaul Volcano Observatory (RVO), PO Box 386, Rabaul, Papua New Guinea. RVO reported that forceful emissions of dense white plumes from Garbuna were accompanied by intermittent ash emissions during 1-4 October to an altitude of 1.6 km (5,200 ft) a.s.l. Occasional weak roaring and rumbling noises were reported in Garu village, about 9 km NW. An overflight on 3 October revealed that existing vents at the summit had increased in size and new vents and fumaroles appeared in the E sector of the lava dome. The main vent that had been restricted to the outside flank of the cone had enlarged considerably (more than tripled in size) and merged with the November 2005 vent. The original vent that opened on 17 October 2005 was larger and vigorously fuming. Although there was little evidence of juvenile material having been ejected and there was surprisingly little eruptive material around the summit, it and areas more than 1 km away from the active vents were cratered, possibly from lithic bombs. Fumarolic activity in the summit region away from the currently active vents had ceased. RVO reported that ash emissions from Garbuna started on 23 September and continued through 1 October. Ash plumes rose to an approximate altitude of 1.6 km (5,200 ft) a.s.l. and drifted NW. Moderate to strong emissions of pale white to light gray ash clouds were observed from Garbuna on the morning of 13 July 2008. Summit activity was low between 1 and 12 July, when emissions consisted mainly of white vapor. The ash emissions on 13 July formed a column that rose about 1 km above the summit area. Seismic activity was generally very low during the corresponding period. RVO reported that white plumes from two sources at the summit of Garbuna drifted SE during 19-21 March. Ashfall and a strong sulfur odor were reported in Kimbe Town (about 17 km SE) on 19 March. RVO reported that renewed eruptive activity from Garbuna started on 11 March and consisted of ash emissions accompanied by occasional booming noises. The resultant ash plumes rose to an altitude less that 1.6 km (5,200 ft) a.s.l. and drifted SW. Fine ashfall was reported in areas downwind. Ash emissions continued during 12-13 March. During 14-15 March, steam-and-ash plumes again rose to an altitude less that 1.6 km (5,200 ft) a.s.l. and drifted SW. Ashfall and a sulfur odor was reported from areas downwind. Occasional booming noises were heard. On 16 March, steam plumes rose to an altitude of 1.6 km (5,200 ft) a.s.l. Observers from KVO (15 km SE) reported that multiple steam plumes rose from numerous vents at the summit. Steam plumes were again noted on 17 and 18 March and a strong sulfur odor was noticed on 18 March. During 1-15 January, the two vents at the summit of Garbuna emitted small-to-moderate volumes of gas. There were no other unusual observations. Seismicity was low and dominated by occasional low-frequency earthquakes. During 21-27 November, two vents at the summit of Garbuna continued to release weak-to-moderate volumes of steam that rose a few hundred meters above the summit and drifted in various directions. No incandescence was seen at the volcano and no noises were heard. Seismicity was at very low levels. Based on information from RVO and satellite imagery, the Darwin VAAC reported that on 25 October a pale gray ash cloud rose a few hundred meters above the summit of Garbuna, but no eruption was noted. RVO reported that an eruption began at Garbuna on the afternoon of 16 October when "white vapor" rose above the volcano and a couple of felt earthquakes occurred. On 17 October, an eruption column rose 3-4 km above the volcano's summit (or 11,700-15,000 ft a.s.l.). At 1100 fine ash fell on the W and NW sides of the volcano, covering two plantations. Water sources originating from Garbuna were affected by the eruption. According to RVO, the volcano last erupted about 1,700 years ago. Garbuna volcano's first historically witnessed eruption in October 2005 was reported in BGVN (30:11) and by 14 November the mountain was climbed. Since that time two reports from the Rabaul Volcano Observatory (RVO), one dated 21-27 November 2005 and the other 1-15 January 2006 both noted weak-to-moderate releases of white vapor from the two vents on the summit. Both reports also indicated that there were no noises or glow accompanying the emissions and that seismic activity was low. The November 2005 report stated that on some days plumes rose vertically a few hundred meters and drifted variably to the NW, W, SW, and occasionally SE. It also noted that the distinct moderate tremor recorded in the previous weeks at the summit ceased by 15 November although weak tremor was recorded on some days, as were small high-frequency earthquakes numbering one to six per day. RVO's January report described weak to moderate volumes of white vapor released from the two summit vents. The accompanying seismicity was low and dominated by occasional low-frequency earthquakes, as indicated by the two stations located 5-6 km E and SW of the summit. Information Contacts: Ima Itikarai, Rabaul Volcano Observatory (RVO), P.O. Box 386, Rabaul, Papua New Guinea; Andrew Tupper, Darwin Volcanic Ash Advisory Centre (VAAC), Bureau of Meteorology, Northern Territory Regional Office, PO Box 40050, Casuarina, Northern Territory 0811, Australia (URL: http://www.bom.gov.au/info/vaac/). Garbuna remained relatively quiet between mid-February and mid-April 2006. The two vents at the summit released weak to moderate volumes of white vapor during this time, but no glow was observed. There was a weak rumbling noise on 14 April. Seismic activity remained at a low level. Few earthquakes were recorded during February and March; the daily average number of high-frequency events was 3 and of low-frequency events between 0 and 5. In April, a few earthquake swarms were recorded with individual events every 1-2 minutes. These episodes lasted less than 20 minutes. Low-frequency earthquakes occurred at the rate of 3-5 times per day and the Real-time Seismic Amplitude Measurement (RSAM) data was at background level fluctuating between 8 and 51 units. Information Contacts: Ima Itikarai and Herman Patia, Rabaul Volcano Observatory (RVO), P.O. Box 386, Rabaul, Papua New Guinea. 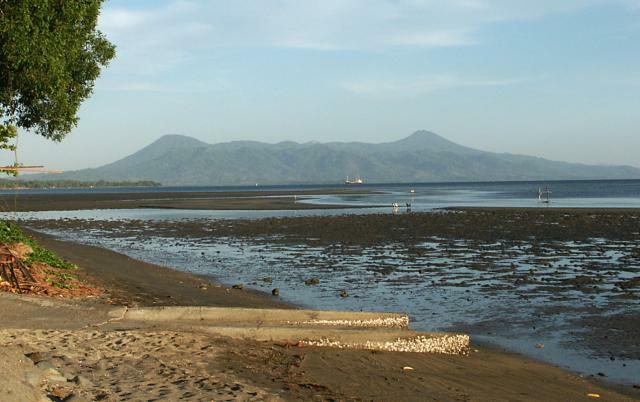 According to the Rabaul Volcanological Observatory (RVO), Garbuna remained quiet from February 2006 through 10 June 2007. Two vents produced the first historically witnessed eruption from this volcano in October 2005 (BGVN 30:11). At least one summit vent continued to release small-to-moderate volumes of white vapor that could be seen from the observation post 15 km SE. There have been no noises heard nor glow observed at night. An aerial inspection on 2 February 2006 revealed that both summit vents had increased in size and contained vigorously boiling water. The town of Kimbe (-16.6 km SE) experienced continuous rainfall during the days prior to this inspection. A weak smell of sulfur was detected 5 km E of Garbuna on 2 February. Seismic activity was at a low level, between 0 and 9 earthquakes per day, dominated by high-frequency events. Some low-frequency events were also recorded. A faulty seismometer at the summit was replaced and a new global positioning system (GPS) station for monitoring ground deformation was installed on 2 February 2006. During December 2006 through 10 June 2007, seismicity continued at a low level, dominated by high-frequency volcanic earthquakes (87 in number) recorded daily; none were located due to insufficient seismic stations. Daily totals in December 2006 ranged between 1 and 16 earthquakes, the highest number of events (16) being recorded on 22 December 2006. No low-frequency earthquakes were recorded during December 2006. During January through 10 June 2007 there were 2-3 daily high-frequency events on average, with up to 5 on some days. The summit seismograph picked up continual tremor from the boiling lake in the main vent. Technical problems with the summit seismometer were experienced at times in March, May, and June. Based on GPS measurements, ground deformation showed no significant changes during this period. Information Contacts: Herman Patia, Steve Saunders, and Felix Taranu, Rabaul Volcano Observatory (RVO), PO Box 3386, Rabaul, E.N.B.P, Papua New Guinea. Garbuna again began to erupt in March 2008. Prior to that, during late June 2007, the summit continued to release variable volumes of white vapor. Occasional increases in volume caused concern in local communities, although noises and night-time glow were absent. An investigation by the West New Britain Disaster Office indicated no other increased activity or emission of solid material. Vapor emissions from the active vent continued through October 2007. Through the end of 2007 and into January and February 2008 activity was characteristically uneventful, with no indication of an eruption. A new eruption began on 11 March 2008. Gray ash clouds rose less than a kilometer above the summit before being blown SW, causing fine ashfall. Occasional booming noises were heard accompanying the ash emissions. Ash emissions continued on 12-13 March, and reports indicated most of the ash fell in the summit area. On 14-15 March the odor of sulfur was reported downwind. No glow was visible at night. Around this time, observations from the Kulingai Volcano Observatory (15 km SE) noted white vapor emissions from numerous vents at the summit area. During 17-18 March activity increased slightly with forceful and continuous emission of white vapor. Emissions rose vertically less than a kilometer before dissipating. There were no noises heard and no glow visible at night. A strong smell of sulfur was again noted to the E.
All of the monitoring equipment installed during 2005 and 2006 was destroyed. The two GPS stations at the summit and at the base remained out of service, and for most of the reporting interval there was no functioning seismometer. Seismicity began to be monitored using a KD1 recorder, along with a portable seismometer to the E, at SiSi village. Seismicity fluctuated between low and moderate levels. On 17 March, seismicity increased to a moderate level characterized by non-overlapping tremor. Only three high-frequency volcano-tectonic earthquakes were noted during the first day of recording; no low-frequency events were recorded. Seismicity declined on 18 March but rose to a moderate level on 19 March. The basaltic-to-dacitic Krummel-Garbuna-Welcker Volcanic Complex consists of three volcanic peaks located along a 7-km N-S line above a shield-like foundation at the southern end of the Willaumez Peninsula. The central and lower peaks of the centrally located Garbuna contain a large vegetation-free area that is probably the most extensive thermal field in Papua New Guinea. A prominent lava dome and blocky lava flow in the center of thermal area have resisted destruction by thermal activity, and may be of Holocene age. Krummel volcano at the south end of the group contains a summit crater, breached to the NW. The highest peak of the group is Welcker volcano, which has fed blocky lava flows that extend to the eastern coast of the peninsula. The last major eruption from both it and Garbuna volcanoes took place about 1800 years ago. The first historical eruption took place at Garbuna in October 2005. Cooke R J S, Johnson R W, 1978. Volcanoes and volcanology in Papua New Guinea. Geol Surv Papua New Guinea Rpt, 78/2: 1-46. There is no Deformation History data available for Krummel-Garbuna-Welcker. The Krummel-Garbuna-Welcker volcanic complex at the southern end of the Willaumez Peninsula rises to the WNW across Stetin Bay. The complex consists of three volcanic peaks, Krummel, Garbuna, and Welcker, along a N-S line. The most prominent peaks, Welcker (right) and Krummel (left), anchor the northern and southern sides of the complex, respectively. The lower peaks of the centrally located Garbuna volcano contain a large vegetation-free area that is probably the most extensive thermal field in Papua New Guinea. Photo by Elliot Endo, 2002 (U.S. Geological Survey). There are no samples for Krummel-Garbuna-Welcker in the Smithsonian's NMNH Department of Mineral Sciences Rock and Ore collection. Large Eruptions of Krummel-Garbuna-Welcker Information about large Quaternary eruptions (VEI >= 4) is cataloged in the Large Magnitude Explosive Volcanic Eruptions (LaMEVE) database of the Volcano Global Risk Identification and Analysis Project (VOGRIPA).